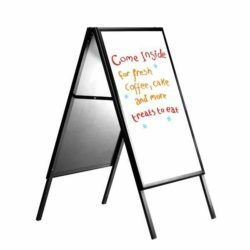 Write-on A Boards are for use with water-base chalkpens and removable boardmarkers. The board is rigid and weatherproof. Pens must be bought seperately in sets. Indoor and outdoor use. Durable and stylish anodised aluminum. Single packed with an easy mounting instruction sheet. No assembly tool. This sidewalk sign can be used in front of bakeries, shops and restaurants. It is designed for indoor and outdoor use. Stable and robust stand of this sidewalk sign creates an effective advertisement area. This sidewalk sign is also known as write on A board. You can easily set up this write on A board.N_ tool is required to assemble the product. 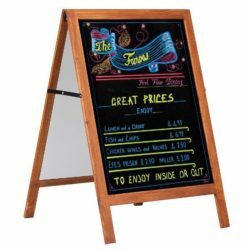 Write-on A Boards are for use with water-base chalk pens and removable board markers. Please do not forget to order pens in sets. There is an easy mounting instruction sheet. The viewable area of this A frame sign is 22″ x 28″ and its background color is white. The frame material of this A frame sign is made of aluminum. 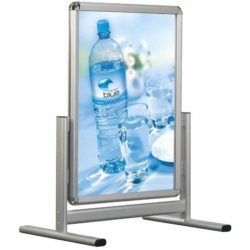 This outdoor signage has long life in use, it is rigid and weatherproof. 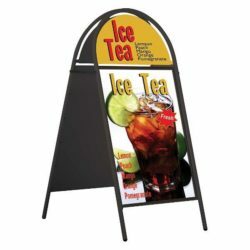 As you can see, this portable A-frame sign is suitable for outdoor and also it is low priced guarantee. 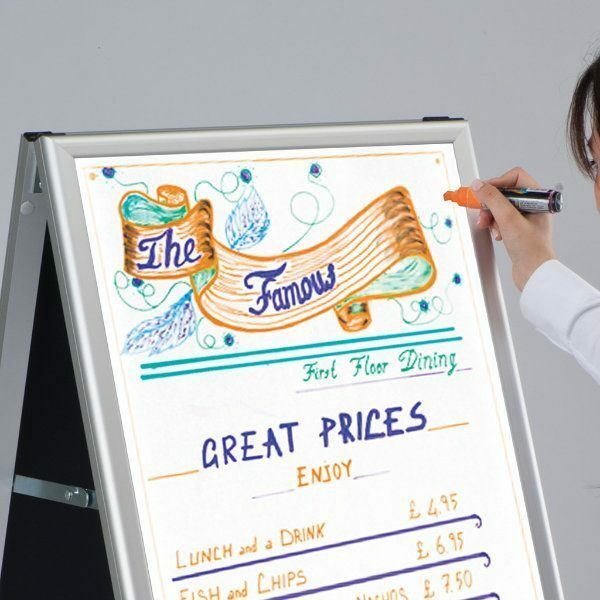 Your business makes a difference in competition to invite customers and increase sales , thanks to this write on A board. 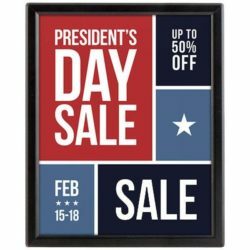 These sidewalk signs are used to advertise a sale or special promotion outside stores and many commercial sites. 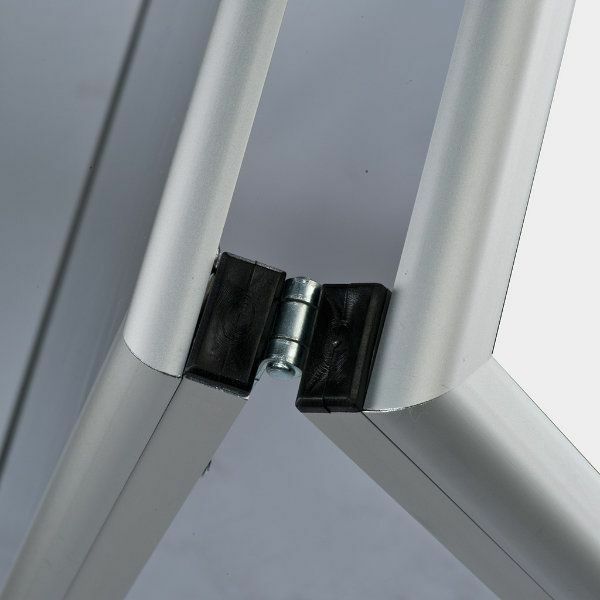 There are two hinges on each side of the aluminum portable A-frame sign and yet becomes a double sided folding A-Frame. The hinges are easy to extend and compress, making these A-frame signs easy to transport. 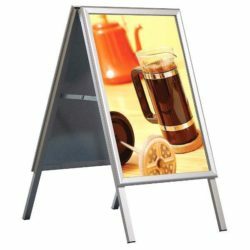 Such outdoor signs as portable A-frame signs, sandwich boards, pavement signs and sign stands are temporary signage that can be put up and taken down with ease in front and out of the shops. This outdoor pavement signage is for outdoor use, yet not intended for use in high wind rain or snow storms. Really like this advertising board. Really works to bring in more business.